History has a way of drawing you in. Lords and ladies, knights and squires continue to mesmerize, with shows like Game of Thrones perpetuating our fascination with days past, or at least how we envision them. If you ever fantasized about the lives of nobles, wonder no more: Just an hour away from Vienna, the family-owned Burg Bernstein, a medieval stronghold overlooking the gorgeous southern Burgenland, offers detox to city slickers and a taste of days gone by. 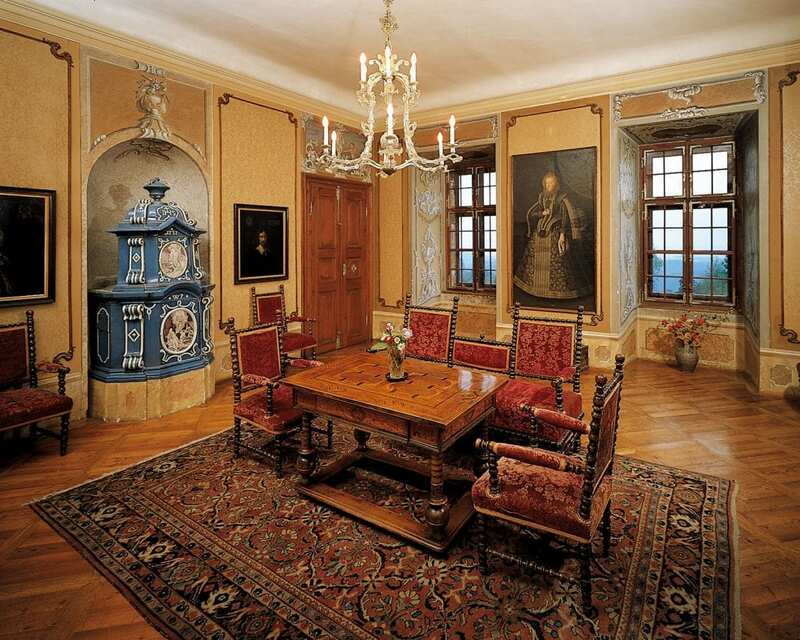 Burg Bernstein has 10 rooms in various styles, sizes and prices, sporting names like “The Vinzenz Double Room,” “The Princess Suite” or “The Pascha Suite,” which is decorated with paintings of barons and former lords of Bernstein. The “Rittersaal” in which you can have breakfast. A night can cost between €90 to €180 per person, including a scrumptious breakfast with coffee, tea, cheese, ham, eggs, fruits, vegetables and homemade jam. High season is from May until October, with only one room available in winter – the only one with proper heating. Taking in guests helps offset the high maintenance costs of the castle – a whopping €100,000 per year. To save money on necessary renovations, several Almásy family members have taken classes in woodworking or upholstery so they can restore their ancestral home themselves. 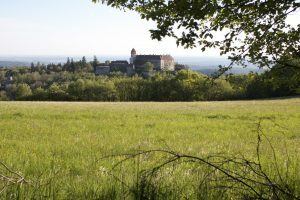 Perched on a deeply forested hill and set directly into the mountain, castle Bernstein gives you the most amazing view over the Great Hungarian Plains and northern Styria. 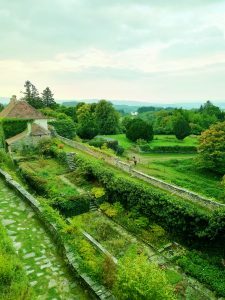 You’ll find a beautiful garden full of wildflowers and herbs surrounding the castle, along with a huge, stunning chestnut tree. Surviving every change, storm and conflict for over 250 years, locals call it “The Immortal Tree.” It’s been around longer than the Almásys. The atmosphere is exceptional – it’s hard to complain when you’re sitting on an ostentatious brown leather chair that might be older than all your living relatives combined, staring at a perfect white ceiling gently illuminated by a golden chandelier. 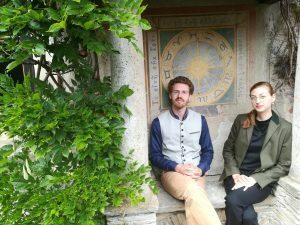 You may even feel a bit embarrassed when you put your shiny new phone and laptop on the smooth surface of a 1,000-year-old writing desk where generations of counts signed important documents – the sense of anachronism can feel jarring. Almásy realizes it can feel alien. “We normally do not call ourselves a ‘hotel’; we like to think about it more like a museum in which you live.” Visitors are allowed to go anywhere they like and can touch anything they want. Those stairs you did not notice before? Let’s go down! That sword mounted on the wall? Perhaps you’d like to see for yourself whether it’s still sharp. A winter garden in one of the hotel rooms. The ghost of Burg Bernstein. 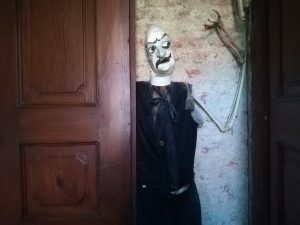 Sometimes, when you look at the crumbling brickwork or hear the wind howl through the windows, you can indeed sense the presence of all those who wandered these hallways before. Once the sun sets, castle Bernstein gets very quiet. 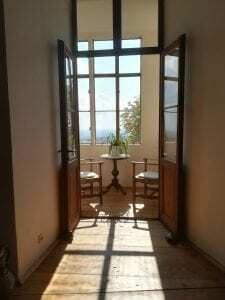 There is no wifi in the rooms, encouraging you to spend the evening in big comfy beds reading a book or taking a bath in an elegant white tub, staring out into the cold, dark night. From Oct 15-21, Burg Bernstein is even having an “offline week” where guest are required to symbolically turn off their electronic devices before entering the main gate, with daily yoga classes and hikes for anyone willing to participate. Rooms are still available. Born 1993, Julia C. Seidl did her first internship at the Austrian news paper "Die Presse" when she was 17. After living in the US for half a year, she went on to study "Journalism & Media Management" in Vienna and continued working as a freelancer for several local news outlets such as ORF, Kurier and Falter. Seidl was employed at the weekly "Die Ganze Woche" before joining the Metropole team as an editor in 2018. She mainly writes about social issues and specializes in doing portraits and interviews. Seidl is the company's Online Content Manager and also responsible for the social media accounts of the magazine.